We were delighted to be given a copy of Niki Segnit’s Lateral Cooking this Christmas. Her premise is to give the reader the skills to become an instinctive cook working with whatever ingredients we find at the back of the cupboard and fridge. To do this she groups recipes together based around a key ingredient, looking at the both the elements in common as well as the differences between recipes. For example, the section on breads moves from flatbreads and crackers to soda bread and cobblers to yeast-risen bread to buns to brioche. We rapidly gravitated to the unstirred rice section, which includes kedgeree, kheer, kitchuri and of course, paella. Niki rightly questions the mystery surrounding what makes an authentic paella. Every Spaniard has their own definitive answer of course. 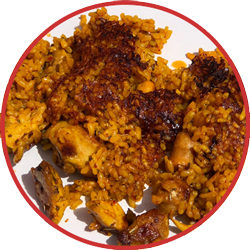 She is right to mention the importance of creating a good socarrat, the crispy rice that forms on the bottom of the paella pan. She is right in saying how tricky it can be to get the amount of stock used, combined with just the right amount of evenly spread heat to ensure the rice is cooked to perfection and the crispy socarrat formed without burning. If using your hob, keep turning your pan every few minutes. Good luck.